Do you ever fantasize about being a super hero like Superman, Wonder Woman, or even an old fashioned hero like Roy Rogers or Robin Hood and Maid Marian? I just finished reading a book about a woman that I can somewhat identify with. She’s about my age. She quit her job as a counselor and social worker to begin a new adventure. She plays the piano to relax. Several years ago she moved to Honduras and began an amazing adventure. She became a super hero in my mind, although she would never make that claim herself. Here’s a blurb from the back cover of the book, EMOTIONAL WITNESS: My Seven-Year Journey as an Aid Worker into the Heart of Honduras. In her 60s, and living in Seattle, Ellen Lippman Finn on a whim signed up for a homestay visit to learn Spanish in Honduras. What began as a two-week vacation became a journey that would transform her life. It would be love at first sight for the former social worker and jazz musician. She fell hard for the people living in Copan Ruinas and the surrounding mountains of western Honduras. She divested herself of her possessions in the U.S., and moved permanently to the area, where she felt at home for the first time in 50 years. 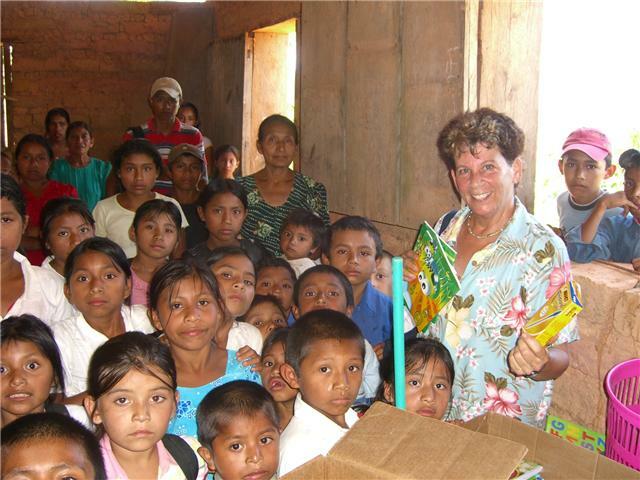 When Ellen first moved to Honduras, she focused her energy on raising funds to provide school supplies for children living in the rural villages nearby. One school she visited had no blackboard, no desks, not even any books. The teacher taught arithmetic by drawing numbers with a stick in the sand. But the lack of school supplies was just one problem. The extreme poverty of the area meant little food and serious malnutrition. Ellen turned to her North American friends to raise funds for food and clothing as well as school supplies. I first heard about Ellen several years ago from the daughter of one of our assisted living residents. At that time Ellen was raising money to give Christmas baskets to rural families. For $25 you could provide a family a gift basket that included toys, clothes, and food for the whole family. We still donate money for four baskets every Christmas to Buenos Vecinos (Good Neighbors), the organization Ellen created. Each short chapter in Ellen’s book is the story of some kind of adventure she experienced while living as an aid worker in Honduras. Some of the stories are funny, like her description of learning to ride a horse – the only way to get to a particular rural mountain village. Others are sad, like the story of a father carrying his small son wrapped in a blanket to get some medical care, but by the time he arrived, the son had died. Some are scary, and many are heart-warming. All together these stories provide a complex picture of what life is like in that area of the world. As word spread about how Ellen was able to raise funds and work with the local people on projects that would improve the living situations in many of the poor mountain villages, more and more people came to her for help. Unfortunately, the drug traffickers learned of her reputation, too, and put her name on their hit list. They didn’t want her working in their territory. Ellen escaped Honduras just in time, recuperated with a friend in the States for a few months, and then moved to Guatemala, where she is continuing her work as Buenos Vecinos in that country. Meanwhile, the particular drug traffickers who were out to kill her have been arrested and are currently in prison. That means she can make occasional trips back to Copan Ruinas to visit her friends there. This is my 70-year-old super hero. Some of her success stories are listed as an appendix at the end of the book – with thanks to her donors. That’s just some of the items listed in the book. See why she’s my super hero! One of the themes of the book is Ellen’s evolving perception of her role as an aid worker and her relationship with the people she is working with. There’s one long chapter near the end of the book that explores that theme in depth. Good intentions don’t necessarily result in good outcomes. Establishing boundaries can be extremely hard, especially in life and death situations. Trying to be helpful can get very complicated. Even for super heroes. I highly recommend reading the book. Here’s a link to it on amazon.com. I guarantee the book will make you laugh, cry, and think.